The Windsong #5 is located on the second floor and offers a fabulous ocean view with all the touches of home. This unit has recently undergone some renovations that make it more appealing and welcoming to guests. This two bedroom unit offers a master bedroom with a queen size memory foam bed for sleeping. The guestroom offers a queen size bed for sleeping as well. For the kids or a couple additional guests, there is a hide-a-bed sofa in the living room to help with the sleeping accommodations that is also memory foam. Other amenities include a fully stocked kitchen with all the cookware and appliances, the living room has a large electric fireplace, cable TV with DVD player (some dvd movies provided for viewing), a stereo and a washer with dryer for convenience. NO smoking- Dogs OK.
Check-in and check-out was easy. The property was very clean and it had stylish dcor. There has been some recent remodeling. Beds were comfortable and kitchen well stocked. I like the location and had a perfect view of the sunset and close access to the beach. It is a perfect spot for 2 couples or a family and is dog friendly. I would definitely stay again and would recommend to family and friends. Tammy is a joy to work with. Beautiful condo, loved our stay! Beautiful condo with a great location! Excellent staff , everything we needed and more! Nice, clean and very well stocked condo. We all had a wonderful weekend and I didnt have to drive half my house to have a get away! The property is well secured. The unit we stayed in was pet friendly. The unit had everything we needed. It was a very pleasant experience. Great place near the beach with everything we needed. Very clean and lots of parking. Thank you! Very easy to make a reservation. When checking in the staff was very pleasant and let us check in early. The staff asked if we needed any info. on anything or needs. excellent service! As usual Windsong 5 was immaculate! My husband & I have stayed a couple of times and this time I took my best friend and we had a blast. She wants to arrange for her husband, son & daughter in-law to stay. 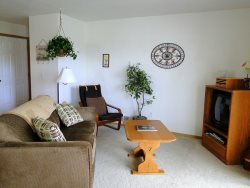 It is always very quiet and the unit is so well stocked and the decor is welcoming and relaxing. Again beautiful unit with everything you could possibly need. Fast and easy check in and instructions for key drop off. Friendly experience overall. Wonderful cozy spot with ocean view and close to all shops. Easy access in and out of Ocean Shores. Clean and comfy with a well stocked kitchen. Would stay here again! We have been staying at Windsong 5 for for over 5 years. We come several times a year. The location is great and the condo is set up just right. The perfect get away. When I called for a later check-in, staff member was very helpful and said she was just about to call us. Our family has stayed at this property for the last 2 years on Thanksgiving and we absolutely love it! The staff is always accommodating and helpful! Our family loves staying here! The condo is so close to the beach and offers all the amenities you would need. A fireplace in the living room and bedroom adds the perfect ambience if it's cold or rainy. I love this property!